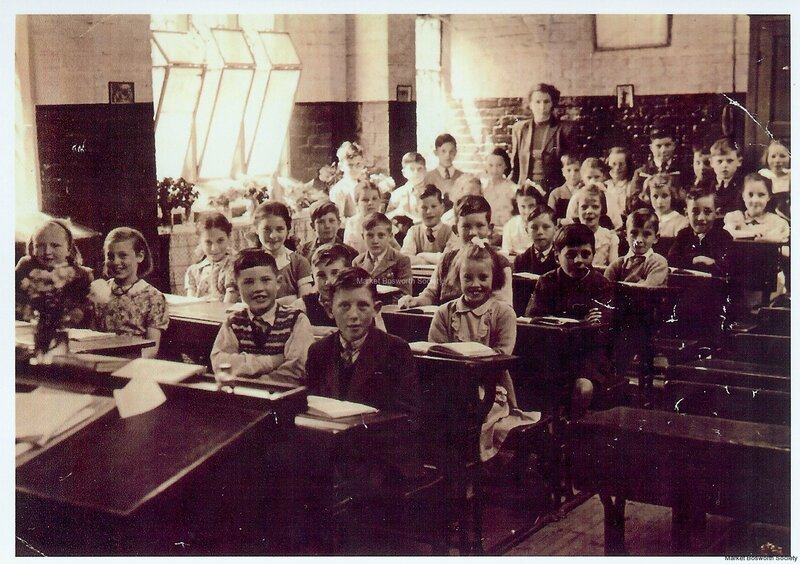 Memories of St Peter’s Junior School, Park Street in the early 1950s. Those who can remember the Infants nursery school in Park Street in the early fifties will recall that it was nothing more than a single roomed ‘Nissen’ hut about halfway along the pathway from the street to St Peter’s church. It was on the left of this path and faced a wall and (to us) mysterious door leading to Mr Beck’s new bungalow. This asphalt road was our playground though we were very limited to the distance that we could stray downhill towards the big school. Down there were large and ferocious youngsters who called us ‘the nippers’ and chased us when they could. Mr Frost, the headmaster banned this derogatory term officially, which, of course, only encouraged it the more! There was a wall and another gate towards the church. We peeped in there and saw the spire of St Peter’s a great distance away. The doorway was dark and fearsome. In the corner of the gate and walls was an iron lamp post around which you could hook your arm and run in circles until you were very dizzy and often sick. Mrs Sabine was a slim lady with very dark and very straight hair-an exception in the age of the perm. We were all very respectful of her and thought her formidable. We were also very fond of her and generally thought her a kind person. Sometimes we would bring her wild flowers, which we knew she liked, or snowdrops in a bowl in the winter. After prayers we embarked on a daily ritual. “A”, we said, says “a”, “B” says “b”, and “C” says “c”. This continued, as one would expect, until “Z” said “zzz”. We were very soon quite sure what they all said and armed with this useful information began to read Beacon Book 1, progressing to 2 etc. until 7 or 8. To help us in this quest for knowledge a student teacher painted a fruit or article against each letter of the alphabet on the wall. She was a good artist and the paintings were very realistic. The letters were perfectly formed and the black paint shone and glistened as she worked. We were fascinated. Around the clock at the end of the hut she inscribed the words ‘Tempus Fugit’. What this meant we did not then know, but we know now and we know that it was true. For writing – slates were used, a thick cold and smooth slate that was encased in a little wooden frame. This was near the end of the days of slates and many were old and broken even then. A square slate pencil was used like a crayon and white marks were made; these could easily be wiped off with a damp cloth and the clean slate was ready again. Sadly, life isn’t that simple and the slates are gone. There was sand, plasticine and clay. The sand was in trays and got on the floor, the clay also – this was a very clinging and sticky substance, extremely messy. Plasticine was better and came in bright colours but after a week or two all became combined into murky balls with the occasional rainbow streak left. We made long rolls and twisted them into many shapes. It had a peculiar smell and got under your fingernails. Most days somebody was sick or wet their pants. Teachers were used to this and had a defence of mop and bucket or a box of sawdust which was tipped over the sick and then stayed there – a fearful splodge which we avoided carefully. The offending sick producer or pant wetter was mollified and sat away from us in smelly discomfort until mothers appeared at midday. The Infants was a happy place. We painted our pictures and sang our songs and seemed to spend at least one lifetime there but in fact it was less than a year and soon time to go on to the big school along the path, where the huge coke heap was and the noisy children; another world to be faced and conquered. Mrs Fisher was the teacher in charge of Class 3, which was located in the crosswise room at the east end of the Junior school building. One door led to the boy’s playground at the back, another to the small girls’ playground at the front. 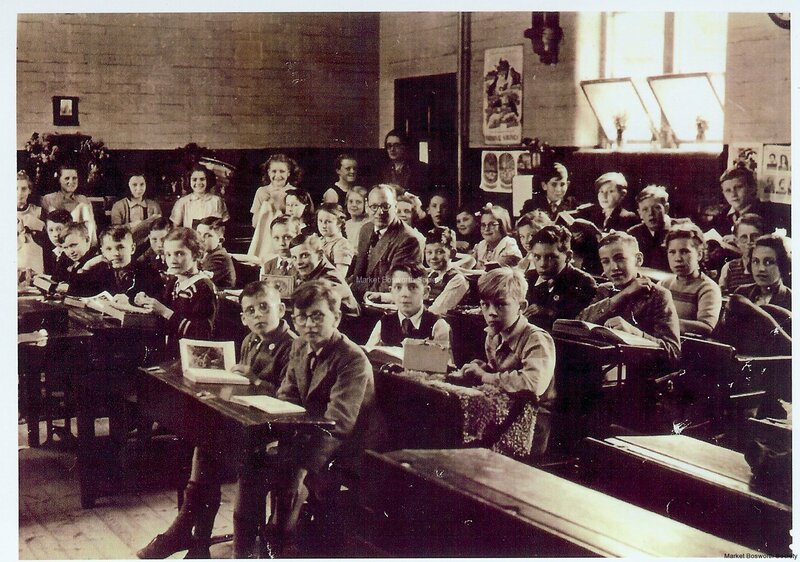 We sat in twos at wooden desks with lids and pot inkwells though I don’t think that ink was allowed until Class 2. More Beacon Books appeared and we learnt simple letter formation and sums of a basic standard. Those people who attended this institution at this time will have crystal clear recollections of every inch of the premises and every significant event. The school was absolutely and quite incontrovertibly under the control of the reigning headmaster, Mr William Flower Gosling; this was ‘Bill’. ‘Bill’ was not to be trifled with, either by pupils or by the staff. His piercing gaze would cause immediate paralysis of the whole body, and in particular, of the tongue. “Boy!! !”, he would cry, with a voice like ripping stainless steel. One would be dumbfounded. What had one done? Something evidently – but what? Where had one been? What, in fact was one’s name? All was blank. Bill would then, unfortunately demand to know where you had been, what had you been doing and above all-why!?!! Hopelessness, trembling, and a dropped jaw. Time casts an anaesthetic over these incident and the many seem to be rolled into one but again, there was no doubt that all would end in Punishment. Detention (short solitary confinement); lines – of course – or even corporal (I nearly wrote Capital) punishment. Fortunately never experienced by this writer, he relies on others for its description. Some would swear that Bill would take a 30 yard run from the end of the corridor, swinging the cane (steel core in the legend) for it to land WACK!!! on the backside. Others would say very little. What was the truth? I don’t even know now. A very clear memory was the extreme straightness of Mr Gosling’s parting, which made a Roman road look like a poodle’s perm. So September 9th was a date to dread. I was at this time 10 years old and of course tried to devise schemes whereby I would not be allowed to go. Mostly, these were variants on me being seriously ill; thus my attendance at the Dixie would be inadvisable and even risky. Diseases which produced severe symptoms were reported to my mother; these included meningitis, poliomyelitis (rife at the time until Dr Salk and then Dr Sabin produced their famous vaccines), various grave tumours and as a last desperate fling leprosy itself, having recently read about the awful experiences of Naaman the leper in the bible. But it was of no use .The day arrived; the new uniform was donned, the new satchel, hymn book and bible, football kit picked up – and I entered Class 2. Ducking was the current initiation ceremony. This meant that you were taken to the boy’s toilets and dumped nastily therein. My mother was very protective, as I was a very small person and threatened dreadful things would descend on the school if FAE was ducked. She was, and remains, a particularly forceful person – and the ducking did not materialise. This was no thanks to my cousin John who made himself scarce – he may dispute this! Our Class teacher was Miss Green, a kind lady and a very good teacher. She taught French. We stuck coloured labels on our school exercise books; red for maths, blue for physics, yellow for latin I think. The Register was called every morning. Allred, Benford, Bennet, Burnham, Eames, Flavell, Granger, Leaman, Loveridge, Oldham, Vines, Williams. Trowbridge joined later. We were of course, co-educational – so Aldridge, Beadle, Butlin, Johnson, McLaughlin, Richardson, Vernon, and quite a lot more apologies to anybody who was there that I’ve forgotten for the moment. There was a 15 minute break in the early morning when Mr Gosling would sell biscuit and crisps, more to keep a close eye on us than to make a profit. He knew everybody. Certain unfortunate teachers would slowly and irreversibly lose control of a class. Conversational rumblings would begin and break into open chatter. “Quiet everyone”, the master would say. A momentary pause and then the chatting would continue, worse than before, Articles would begin to fly through the air and fall to the floor. There began laughter, giggling and rude sounds. “Stop it at once”, the teacher would repeat. “Please do stop this, straightaway”. Too late – the point of no return was past. The noise would grow into a slow, increasing roar, a thunderous low frequency squalling heard throughout the building and especially in adjacent classrooms. Then – a sudden crash! – as if a huge camera shutter had been triggered and the classroom door, previously shut, was now seen to be open without, incredibly, any intervening movement. Bill was standing at the entrance. All movement would cease. Persons froze into the positions of the moment and items would be suspended in mid-air. Bill would not speak for a full three minutes. The tension was unbearable. He would not blink. The classroom teacher would sit, set immobile also at his desk. Time had stopped. Bill would then beckon, slowly and almost imperceptibly, with one finger at two or three known troublemakers. Meekly and with heads held low, they would stumble after Bill, up the stairs towards the unknown region. Would they live? Would they return? I apologise for dwelling on these matters at such length. It is just that memories so vivid deserve to be recorded. In particular, I recall one morning assembly – soon after the incident, I think, when some foolish person had carved an extremely disturbing word deep into a desk. No one would own up, and the atmosphere was bad. Nowadays, counselling might have been suggested for the culprit, or he might be encouraged to carve yet more words until he had expressed himself fully. Not then though. Not by any means. This was war. Bill decided to attack on another front – when we were in assembly. He began quietly. This was especially bad news, as connoisseurs will recall. Our stomachs churned. Mr Gosling began by describing proper forms of dress and behaviour; the necessary conventions and pride in ones appearance. Especially in public places. He became excited, energetic. Defects in our demeanour were described – the crumpled caps, the blazer fronts spattered with gravy and, of course, quantities of custard. Peas had been flicked with knives in the canteen. Our ties were thin and stringy; our shoes were down at heel and scuffed. He shouted, stomped his feet, waved his arms violently in the air. He became very red in the face, then purple, indigo; apoplectic! “A boy”, he shrieked- “A boy!! !- has been seen!! aargh!! upppf!! -drinking out of – A – A– BOTTLE-!!-BOTTLE!!–BOTTLE!!! None of us were ourselves for at least a week. In later years, towards the end of the sixth form, I came to know Mr Gosling well – in fact we became good friends. I found him then to be a helpful and kindly man and I have much to thank him for. We corresponded and he visited me at college; later he attended my wedding to Mary-Rose. I always tried to call to see him when I came back to Bosworth, and we would chew over many memories – but not necessarily the aforementioned. We wrote to each other until the week before he died – I was in Australia at that time. I found it difficult to relate the fearsome headmaster to the valued friend but I suppose it is a function of one’s age; one’s fears and perceptions. “He definitely used to frighten me”, Spencer Lewis (the RE teacher) said to me a few years ago, though! Lots of other things happened at the Dixie in those days over thirty years ago; there are a few to come yet! and Ray Carter’s memories of his time at BPI 1937-1984. After purchase of Bosworth Hall (now a Hotel) in the 1930s by Leicestershire County Council, work started on changing the Hall into Bosworth Park Infirmary (BPI) which was to be housed in this beautiful 17th century mansion built by the Dixie family with 19th century additions in Queen Anne’s style by the Tollemache Scott family. The plans included a new 2-storey block, always known as the New Block, to accommodate wards and a long 2-storey Nurses’ Home (now St Peter’s Court and private residences) within the grounds. The Hospital was opened in 1936 by Sir Arthur Hazelrigg having 177 beds for the chronically sick. Several hundred babies were delivered each year from the 19 maternity beds until the hospital’s closure in 1987. The special needs of the spastic children were dealt with by a physiotherapist and a speech therapist available in what was the only facility in the Sheffield Health Authorities Region at that time. The Hospital also catered for geriatrics, the chronic sick, convalescent patients and military personnel (REME) based at Gopsall Hall. The BPI also carried out minor operations on children with specialists such as a surgeon and an anaesthetist travelling from Leicester for operations of ear, nose & throat. The anaesthetic used, in the early days, was ether poured over a cotton pad. Miss Mabel M. Stringer 1936/49; Miss Mabel Wilson 1949/59 and Miss Alice Mole 1959/87 (on retiring she married Mr Cyril Long). Visiting was allowed twice weekly and at weekends but not with children. No one was allowed to sit on beds. Fathers of the new born babies could not kiss their child, or the mother, and relatives were restricted even more so, a practice introduced to protect the patients and babies from infection. These rules against embracing patients and restricting access, although seeming severe by today’s standards, have been proved to be effective by the low incidents of infection in hospitals at that time. Dr Gordon D Kelly who resided at Beech House in Church Street was the hospital medical officer. Reports from staff attest to his attitude and high work ethics and he was a favourite with the BPI nurses. Dr Chandler was a local locum also on call to BPI. Mr H R (Ray) Carter was the Secretary 1937 to 1984 (47 years), apart from serving in the Navy in WW2. His assistant Mr William (Bill) Rose came straight from college in 1938 & stayed to 1968, when he was appointed Secretary at Hinckley Hospital. It is Ray’s records that have supplied the larger part of this history. A ‘Friends of Bosworth’ was formed in 1956 to cover both Bosworth Park Infirmary and West Haven, made up of many local people and others to support the work of the hospitals by visits, help and comforts etc. Gifts provided for Bosworth Park Infirmary included a cordless radio headphone system and most of the ward televisions. Mrs Margaret Keay, wife of the County Architect, Mr William Keay of Pick, Everard, Keay & Gimson, architects for the Hospital, was Chairman of the Hospital House Committee for many years. The wards positions were changed as circumstances dictated. To the left of the Hall’s west façade and main entrance to BPI was the 19th cent buildings erected by Squire Charles Tollemache-Scott around a courtyard and where the stables had been. In the first building on the left as you passed through the courtyard arched entrance was a single-storey building and here was located the sewing room, where clothes and sheets were repaired, (now the Hotel’s Reception area). Further along was a 2-storey building known as The Cottage. Upstairs was the Secretary’s early living quarters. Matron’s office was an imposing oak panelled room, previously known as the Justice Room when the Squire was the local magistrate. The Secretary’s office was in a corner room at the front of the Mansion adjoining the black and white marbled Front Hall, part of which was screened to provide a reception office, telephone exchange etc. The work of the secretarial staff included staff records, salaries and wages, patients’ records, ordering and control of all supplies and storekeeping etc. The Porters’ Room was in the cellars below the ground floor of the Mansion. These were used to store such items as beds, furniture etc. A pair of old prison doors from the infamous Newgate Prison in London, given to the early Dixies, was mounted at the doorway to one of the cellar rooms, and with the man trap and a coffin, also on display, provided a gruesome thrill at the ‘Chamber of Horrors’ exhibition at one of the fetes organised by the Friends of BPI to raise money. The story goes that the 4th Baronet Sir Wolstan Dixie discovered his daughter Anna was having a liaison with a local yeoman farmer’s boy. As this would have been below her station in life, her father was angered and had the mantrap (a vicious spring loaded trap with sharp jaws) set to catch or deter the boy in the copse known as The Wilderness where the couple were known to meet. The trap caught Anna Dixie who lay there all night, her injuries led, eventually, to gangrene and she died. Since then there has been a rumour that her spirit haunts the Hall in the form of the Grey Lady. SEN Margaret Girgens, one of the reunion organisers, claimed to have seen the Grey Lady one night and was terrified. Nurse Jean Jones reports two encounters with an apparition, one seen on the Victorian bridge. The trap is now believed to be in the possession of the Vero family. The number of working hours was 48 for nurses in 1950 but this was flexible and shifts were operated to cover 24 hour working. ‘Clocking-In’ was introduced in the 1970s. Salaried staff often worked longer hours to cover weekends and evening periods. The number of staff changed over the years and typically would be 4 admin, 1 driver, 2 machinists, 3 teachers, 3 porters, 4 gardeners, 5 maintenance, 6 kitchen, 8 laundry, 10 cleaners, 5 male nurses, 5 ward sisters, and up to 100 nurses of various grades ie: SRNs, SENs and trainees, Matron & Assistant Matron, gave a total of around 150 BPI staff. Nurses were housed in the stylish Nurse’s Home (now St Peter’s Court) within the grounds of the Hall or in the Dower House (night nurses) a short distance away and some lived locally. Matron had a suite on the ground floor of the Nurse’s Home. The Hospital was also a training school for assistant nurses to SEN level. The dining room for male staff (originally located on the left of the BPI reception room) was converted to a nurse’s classroom where it could be accessed from the stable quadrangle. Female staff had their own dining room on the left of the main entrance in the Hall with a separate one for male staff. A teaching unit was also located at the end of the New Block and a Prospectus was produced to attract nurses to BPI. A fortnight annual holiday was allowed but with no bank holidays. A Staff Social Club was formed and organised dances and fancy dress parties in the BPI Recreation Room, built over the Stores with a specially constructed maple-wood dance floor, with music by Ivor Pope & his Band. Outings by bus were made to the Royal Horticultural Show at the Chelsea Barracks, to Coventry for the pantomimes, Wickstead Park and other venues for staff and some patients. A variety of sports activities were available including tennis on a hard court, two grass courts, a putting green on the south lawn, with walking and cycling groups among staff?. Sergeant Raybould was attached to BPI in 1940 from REME based at Gopsall to see that soldiers rehabilitating and recovering behaved themselves in an orderly military fashion. The atmosphere that was created at the BPI from reports, staff oral history interviews and comments from the officials of the various management and supporting organisations indicate a most happy hospital. Hard and careful endeavour with just and fair standards made the BPI a family of staff and patients and an example of how a hospital should be run. Staff from the BPI who contributed to this history are Reg & Nancy Sperry 1937 to 1982, June Cooling, Janet Brown, Madge Stanton, Madge (March) Vero nurses and Mr Ray Carter, the BPI Secretary. Booklet: ‘One of the Best’ Bosworth Park Infirmary, by Laura Croman, Glynis Oakley & Roy Illston.